What happens if the items come before the invoice? 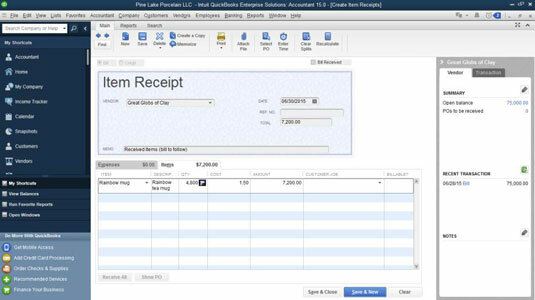 What should you enter in QuickBooks 2015? Lucky you — you have the stuff, and you don’t have to pay for it yet. However, you do have to record the inventory you just received so that you know you have it on hand. Choose Vendors→Receive Items, or click the Receive Inventory icon on the Home screen, and select the option to Receive Inventory without a bill. Fill in the top part of the window. If you want to record items from a vendor who’s already on the Vendor list, click the down arrow and then choose the vendor. If the vendor is a new vendor, choose Add New from the drop-down list and then, in the New Vendor dialog box that appears, describe the vendor in detail. When you’re done with the New Vendor dialog box, click OK.
You need to click the Items tab only if it isn’t already displayed. It probably is. But, there’s another tab — the Expenses tab — and you could possibly display it instead. Move to the Item column and type a name for the item. Notice the down arrow in the Item column. Click it to see the Item list. Does the item that you’re paying for appear on this list? If so, click it. If not, enter a new item name. You see the Item Not Found message box. Click Yes, fill out the New Item dialog box, and then click OK.
You may just as well go down the packing slip, entering the items on the Items tab. Make sure that the Items tab accurately shows what’s on the packing slip. And put a brief description of the items in the Memo field because that description might prove useful later when you want to match up your item receipt with the bill. Qty column: Describe the quantity you received. Cost column: Describe the item unit cost. If the item unit cost you enter represents a change, QuickBooks asks if you want to update its standard item cost (as stored on the Items list) and whether you want to update your standard price for the item. Click the Save & New button or the Save & Close button to record the items that you just received. The items are officially part of your inventory. The item receipt has been entered on the Accounts Payable register. Not only that, but you’re also all ready for when the bill comes.